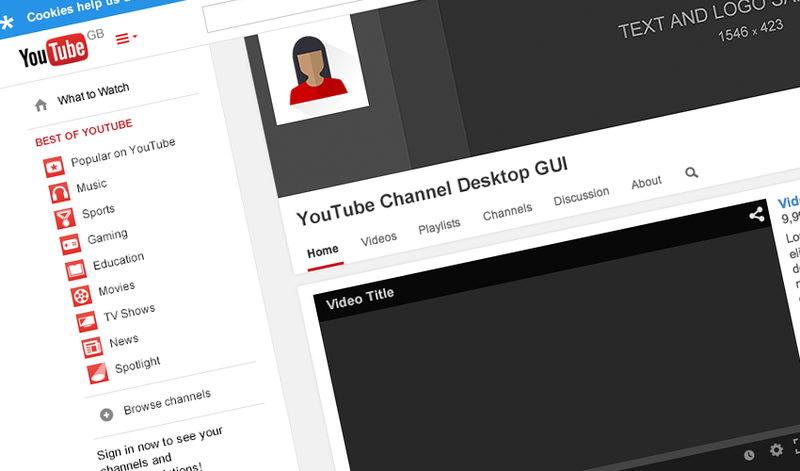 Our gift to you: A fully editable and scalable version of the latest YouTube Channel GUI PSD artwork for your mock-ups and presentations. Since it’s creation in 2005 there have been some major redesigns of the user interface with numerous iterations between each release. Google’s video streaming service has become integral to some of our clients social campaigns and often find a need to customise a YouTube Channel with the client’s brand. Typically, working with an edited screenshot of the latest version of the site interface has been an adequate solution for visualising the brand channel prior to working with YouTube’s channel art guidelines. But when you want to go further with the customisation then an editable artwork file is necessary — this usually culminates in a long and often fruitless search for a PSD GUI created by a designer who has been through the process of recreating the artwork, and has been kind enough to share with the world. Unfortunately for us, our search for a current version of the YouTube Channel GUI returned inaccurate and out of date examples and, of the options we found, were of a sub-standard quality. For us, apart from accuracy and a high level of editability, it is essential that our artwork be scalable in it’s entirety in order to use it in whatever media format we require. This is always a challenge for web optimised artwork and is a problem not easily overcome as all elements of the user interface need to me meticulously recreated as scalable vector artwork — which is exactly what we have done! Enjoy and please feel free to use the artwork for your mock-ups and presentations, letting us know if you spot anything awry or would like Gallant to produce similar high quality artwork.